Thank you to Oriental Trading Company for providing some of the supplies used to create our Halloween centerpiece. All opinions expressed are my own. Halloween is such a fun time of year to decorate. I always try to find a good balance between cute and spooky. My favorite part of Halloween is handing out candy to all the trick-or-treaters, so I would feel terrible if I ruined even one child's Halloween because something at my house was too scary. 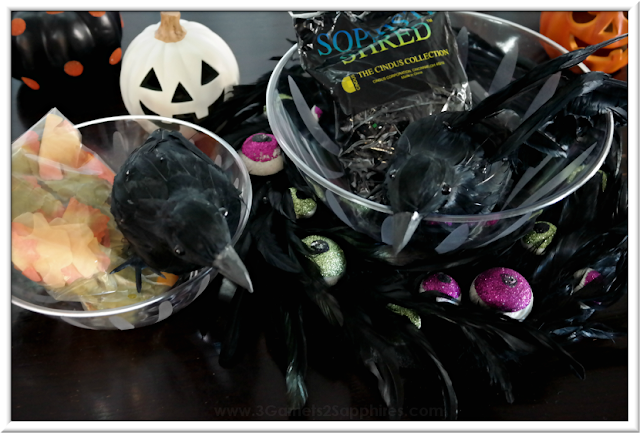 This year, I saw some black feathered crows in Oriental Trading Company's Halloween Headquarters. I showed them to my children, who thought they were pretty cool looking, so I felt inspired to come up with some easy crow-themed Halloween ideas. How to Make a Crow's Nest Candy Bowl Centerpiece . . . Step 1. Separate your artificial leaves into two piles, one pile for crinkled leaves and another pile for flat. 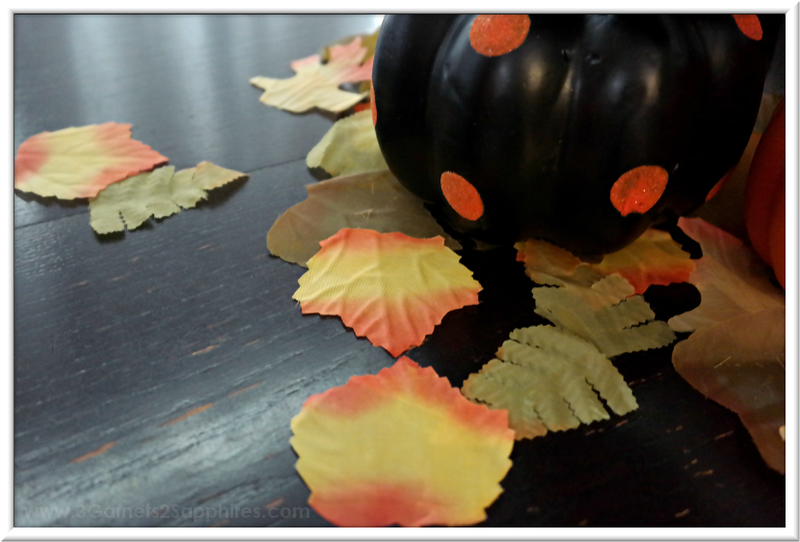 Take the crinkled leaves and make a large bed of foliage at the center of the table. Then scatter the flat leaves on and around the pile of crinkled leaves. TIP 1: Using flat leaves in the areas around the leaf pile will make it easier for you to place other decor items or serving bowls and platters on the table. Step 2. 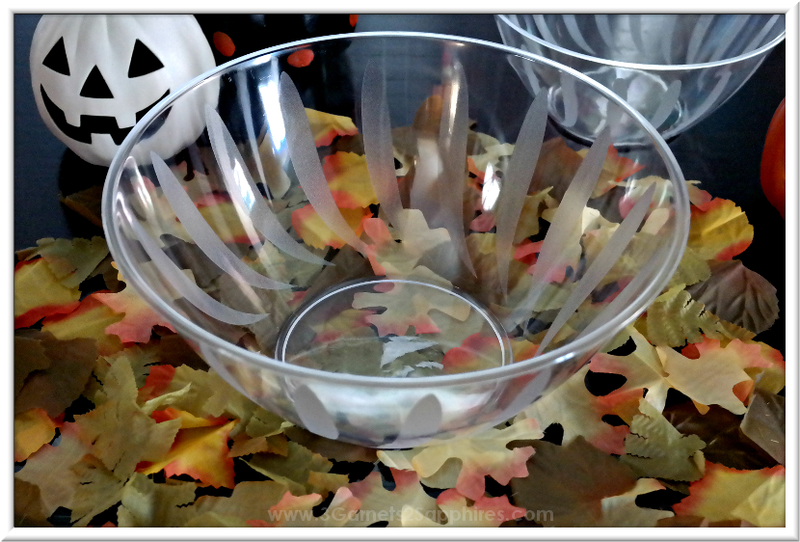 Place the larger of the two clear round serving bowls in the center of the leaf pile. Step 3. Place the black shred (black Easter grass) inside the large bowl. Pull the shred apart until it is loosely intertwined and covers the bottom and sides of the bowl all the way to the brim. Then nestle the smaller clear round serving bowl inside the bowl of black shred. TIP #2: Although you want to have the shred to show above the rims of the bowls, you can pull out any long strands hanging down over the edges to neaten your nest a bit. Step 4. 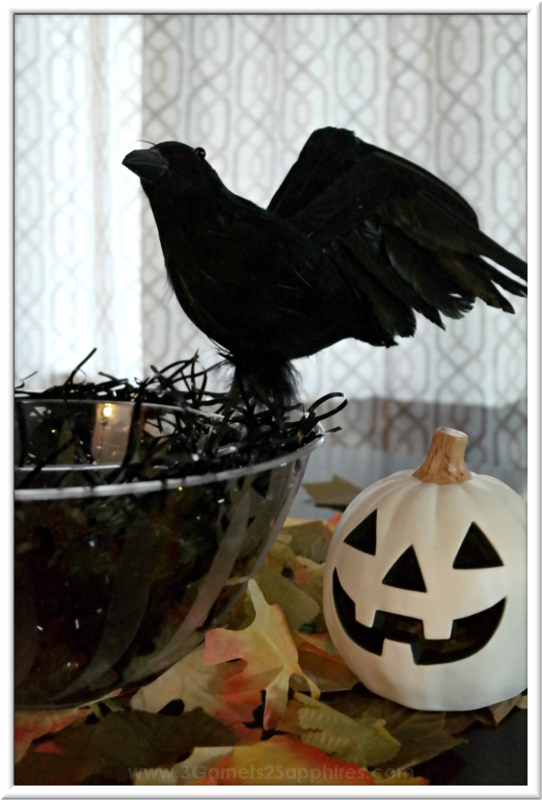 Add the decorative black feathered crows to your centerpiece. 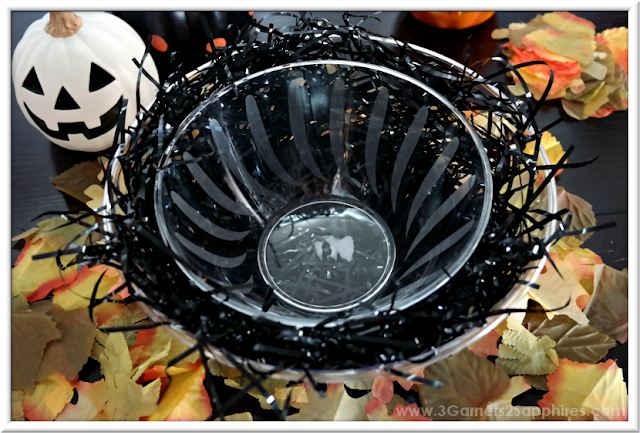 The pair of crows from Oriental Trading Company have wires at the bottom of their feet so I could bend the wires around the edge of a bowl or a pumpkin stem to help position the crows where I wanted them. Step 5. Fill your crow's nest with the candy of your choice. One bag of bulk candy should be enough to fill this candy bowl to the top. TIP 3: Want to use your crow's nest candy bowl for handing out candy? If you have a place to set your bowl down on your porch, then the crow's nest can be used as-is. 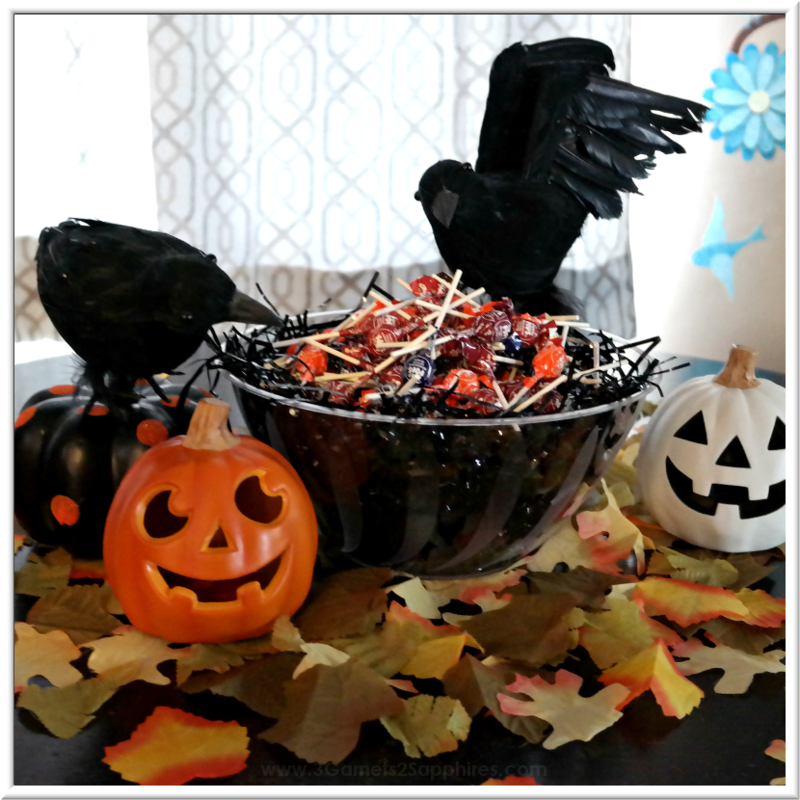 If you need to hold the candy bowl or carry it to and from the door, then simply remove the crow. Step 6. Add a few small pumpkins to complete your Halloween display. More Black Crow-Themed Halloween Ideas . . . I also found this cool Eyeball Feather Wreath at Oriental Trading Company. This wireless wreath was perfect for our door and will surely delight trick-or-treaters. It runs on 3 AA batteries (not included) and has an on/off switch on the back. 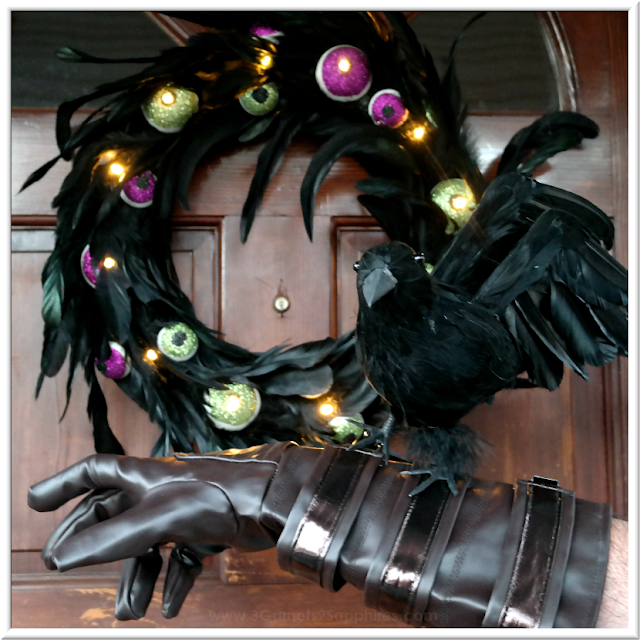 You could also place the smaller of the two crows in the center of the wreath. I also thought it would be super-fun to have a crow on your forearm when you greet trick-or-treaters on Halloween night. To do this, simply take a glove or gauntlet with buckles or fasteners on it and wrap the wires on the crow's feet around the buckles. We used an Anakin Skywalker costume glove and it worked out perfectly. How will you be decorating for Halloween this year? Share your ideas with us in a comment here. 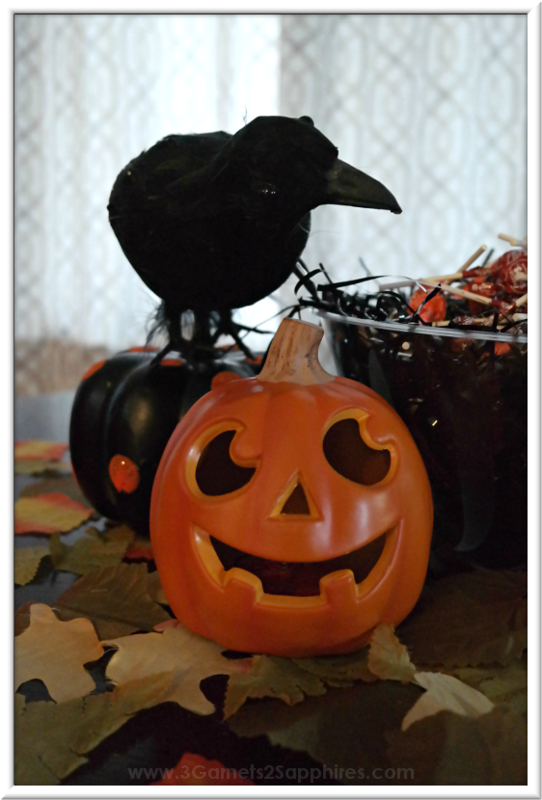 Remember to Pin these Crow-Themed Halloween Ideas for later! Also, be sure to check out our Zombie Head Eyeball Centerpiece from last year . 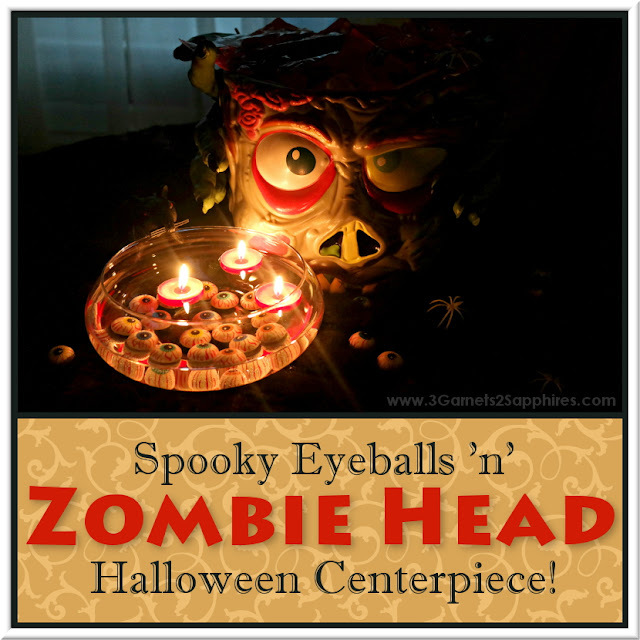 . .
Visit Oriental Trading Company for more fun Halloween ideas and supplies to inspire you! Just having a quick look around always sparks new ideas for me.